Guild Care’s outreach service offers a range of diverse services for older people living in the community that allows them to remain independent at home but also access facilities outside. These services include the home care team, which provides domestic and personal care for people in their own homes, advice on how to cut your energy bills and what benefits you might be entitled to, support after a stay in hospital and their transport scheme, which provides a door-to-door service to various Guild Care centres. The home care service promotes independence by helping people with many aspects of their daily lives, such as personal care, including washing and bathing, preparing snacks and meals and getting in and out of bed, and also domestic care like shopping, housekeeping and picking up prescriptions. With their friendly and professional community care assistants, home care enables older people and vulnerable adults to lead better quality lives while remaining safe and comfortable in their own homes. After a stay in hospital it is often quite daunting for people to be back home on their own, at a time when they can feel most vulnerable, or unsteady, and it can be the little things that are the most difficult to deal with. Guild Care provides a home from hospital service with an ethos of helping people remain independent at home following a stay in hospital. 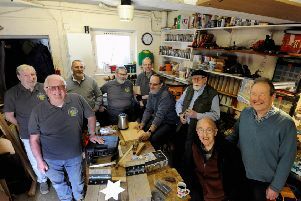 The charity does this by organising a volunteer to pop in once a week for up to six weeks to help with things such as prescription collection, basic shopping, escorted walks, preparing light snacks and telephone support. One user said: “I looked forward to my visits very much, they helped to support my recovery and laughter is the best medicine. My volunteer was polite and had a lovely Irish accent. To help people access its services as easily as possible, Guild Care offers a transport service that connects people to its centres and services, including the day centre at Methold House, Time out for Carers at The Bradbury Wellbeing Centre, other dementia services and outings for the Ashdown Centre. A dedicated team of staff and volunteer drivers collect customers from their homes, bring them straight to Guild Care’s centres and take them home again in Guild Care’s fleet of nine minibuses that are all wheelchair accessible. This service is a vital part of Guild Care’s work in reducing isolation and improving the health and wellbeing of older people in the community, connecting local people to the services when they cannot drive, or who may not be confident about leaving their home. For more information on Guild Care’s outreach service, contact the customer enquires team on 01903 327327 or email enquiry@guildcare.org.